Top Ten Reasons to watch "The C Word"
Owen (Rob Huebel) plays the trumpet. There's some kind of time warp. Surprise cameos from three pop stars, a famous stand-up comedian and a Sports Illustrated™ Swimsuit Model. Hot teen heart-throb Chase McKeever is both host and musical guest. Glenn (Ken Marino) says the line "Give me 40 CC's of epinephrine, and prep a tetranizadol drip, STAT!" 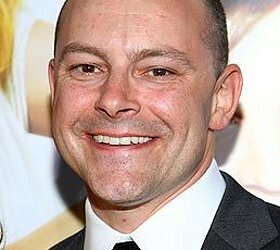 Blake (Rob Corddry) slips on a banana peel.